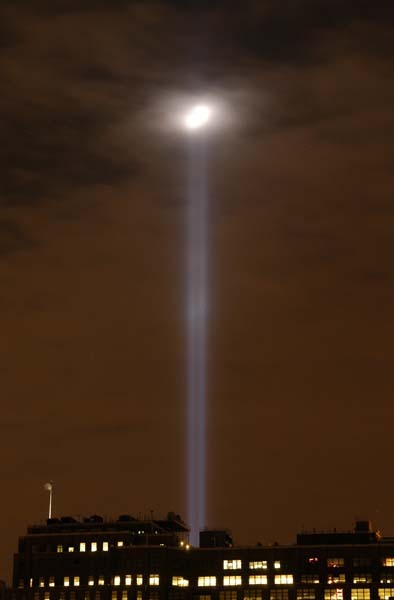 I do not believe there will be another 9/11 light memorial, so I will not have a photograph to accompany this post. Another anniversary has arrived and in many ways little has changed. For me 9/11 is still a day of quite contemplation. Nothing can bring back the victims of this tragedy and so all we can do is try to honor their memory. But in other respects much has changed. A new building is rapidly rising on the World Trade site. More importantly one of the chief perpetrators of this tragedy has met his fate. I do not consider myself a violent person and normally I do not rejoice at the death of people I do not like. But Osama bin Laden was America’s mortal enemy seeking to take more innocent lives. I am quite pleased that he is not around on this anniversary. In the past I have always remarked on the anniversary of 9/11. While it is true that the terrorist attack has little if any connection to the subject matter of this blog, this day always has such an impact on me that I previously felt the need to provide a small comment. Initially I planned to skip writing about 9/11 this year but recent events have persuaded me otherwise. The site of the former World Trade Center no longer truly belongs to New York City. It is sacred ground that belongs to the whole country, perhaps the world. But that sacred ground does not extend beyond the footprints of the lost towers. It bothers me that so many people feel the need try to impose their views on where an Islamic Center should, or should not, be built. That ought be a subject for residents of New York only. But it bothers me even more that so many are trying to use this anniversary to advance their own agendas. Demonstrations and counter-demonstrations are not the way to honor this day. Would such demonstrations be held inside of a church or synagogue or, dare I suggest it, a mosque? I would have hoped that all Americans would put this discourse aside for today and truly honor the victims of 9/11. 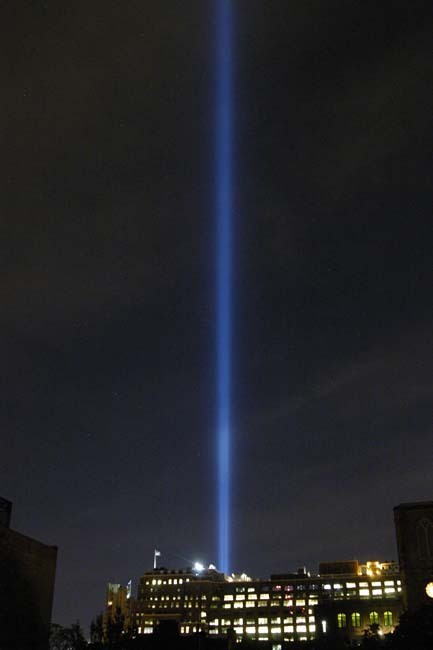 PS – There was another 9/11 light memorial this year. I am so glad, it is such a moving tribute. So I have added this photograph taken from my window. It seems that 9/11 is all too rapidly fading from public memory. I am sure those directly affected have not forgotten but now is certainly not the time to for others to forget either. Not only are the Taliban and Al Qaeda undefeated, their influence in Afghanistan has actually increased. I do not normally consider myself a hawk but I do not see how we can safely ignore the fact that our enemies would like nothing more than to strike again. It is gratifying that this administration has placed Afghanistan at a higher priority. I do not know if the approach they are taking will actually work. If not we must be willing to try others methods. We owe it to ourselves and we owe it to those whose lives were sacrificed eight years ago. P.S. 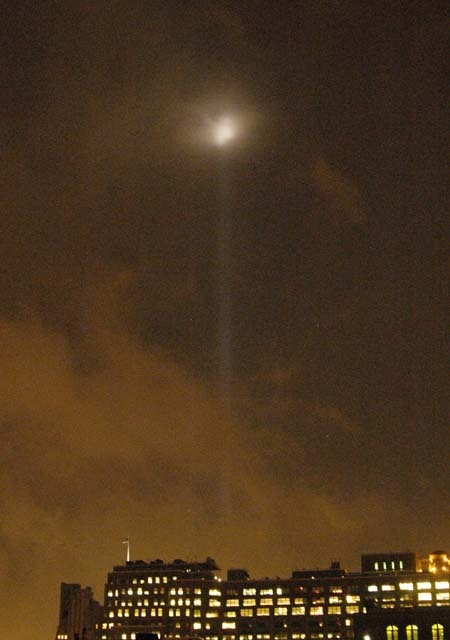 In the past I usually accompany my 9/11 post with a picture of the Tribute In Light taken from my living room window. I particularly wanted to do so this year as well because it may be the last for this moving memorial. However the skies are so overcast that the lights are not visible. If it clears up I will add it later. It is sad to say, but few of the people that I worked with mentioned anything about 9/11 today. Those that did felt that the time had come to get over it and treat it the same as other neglected anniversaries. After all how important was the 7th of December seven years after Pearl Harbor? But by Pearl Harbor’s seventh anniversary the war with Japan was over while many of the terrorists who planned and supported the 9/11 attack are still alive and working towards further violence against our society. Al Qaeda and the Taliban are now firmly entrenched in what is usually described as the tribal areas of Pakistan. Their strength and influence is steadily growing. This is an election year but I do not believe this is a partisan issue. I do believe it is an issue of perseverance. I understand that it is a complicated problem and I do not claim to have the solution. But something has to be done or 9/11 will not always remain the only anniversary of an important terrorist attach on America. Now is not the time to forget. 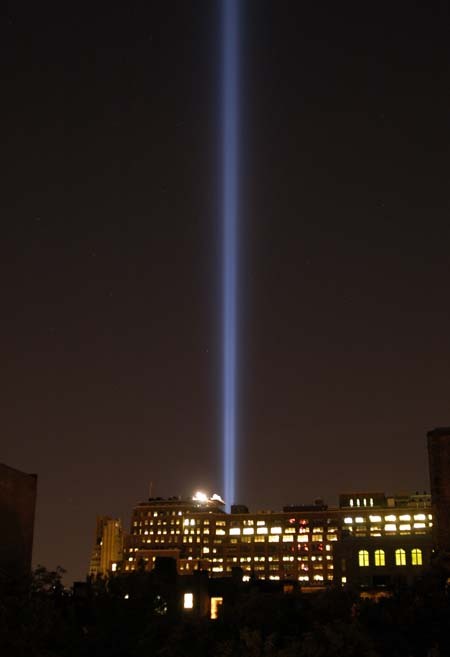 Posted September 11, 2006 in 2006/09, 9/11, z Archive. I was prepared to post on another Captain America double page splash. Although my work day was busy enough to keep my mind off the date, now that I am home the old feelings return. As I look out my window I can see the lights extending from the former site of the World Trade Center up into the clouds. It is a very moving memorial. I live in Chelsea, the lower west side, not too distant from the ground zero. I could write about my experiences of those days but today is not about me, it is about the people who suffered from that terrible attack. Too many went to work that day like any normal person, but before the morning was over they became American heroes.